In 1943 the Nazis war machine had subdued most of Western Europe. A very young Ted Norman joins the 448th Bomb Group based in Seething, England, as part of the Allies effort to win the war. Casualties are high with typically 1 in 20 aircraft missing every mission. As the bombing raids push ever further into enemy territory, Ted is forced to reach the very limit of his own endurance in order to become the Captain his men depend on. 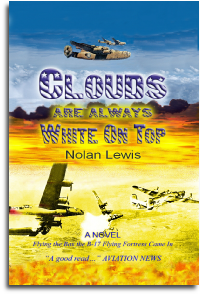 Nolan Lewis has based his book on his experiences of World War II. What a great story, it has it all; courage, fear, love, war, pain, nightmares, action, death and killing and compelling characters. © W. H. McDonald April 14, 2007. Reviewed © Aviation News - December 2006. If you like well-written, realistic war stories, you won't be disappointed by this author. There's a lot to be learned in subtle ways through another person's experiences. … Forty-two flights over Germany and home by age 20. Unbelievable! Reviewed © Kaye Trout - June 20, 2006. Compelling, dramatic and very readable. For much of the book I was captivated by the hero of our story who was so young and within weeks became so old. ... This is not a novel just for aviation buffs; it's a compelling, moving and dramatic account in its own right that just happens to feature flyers drafted into the Army Air Corps in WWII. If the author has a sequel up his sleeve, I'll be the in the queue to buy the book. Reviewer: © Michael Watson - 22 Jul 2006.